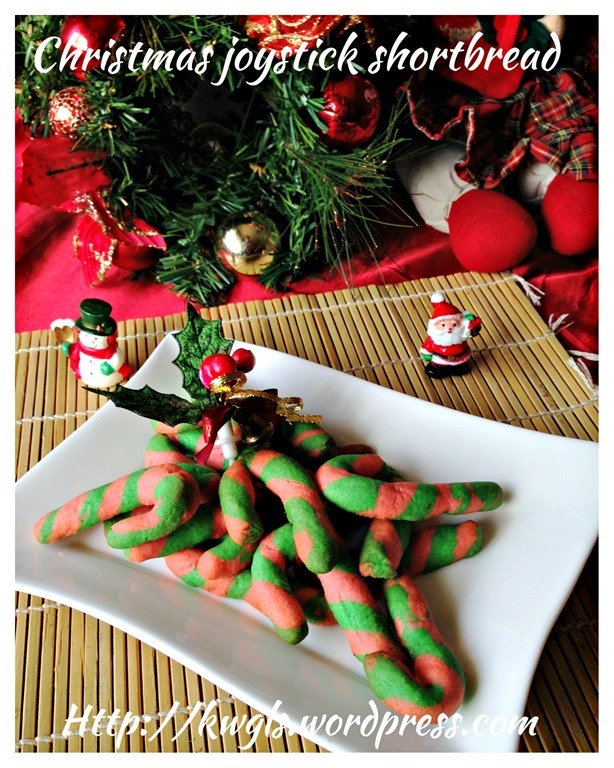 My Christmas recipe this year is coming to an end. I still have a Panettone recipe yet to issue and thereafter I will do a compilation to facilitate readers to locate the recipes. 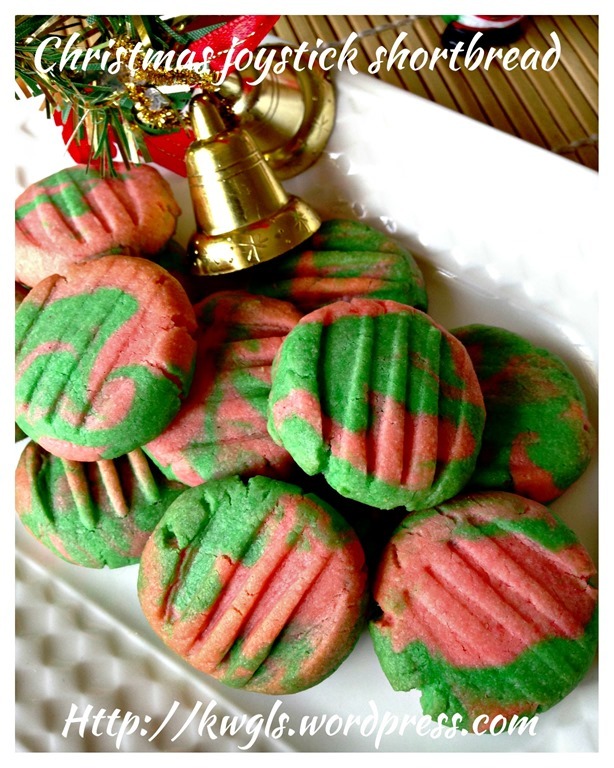 Cookies is common during Christmas for Western bloggers… In fact, cookies recipe are not popular throughout the year until the period of about 1 month from Thanksgiving Day to Christmas Day itself. 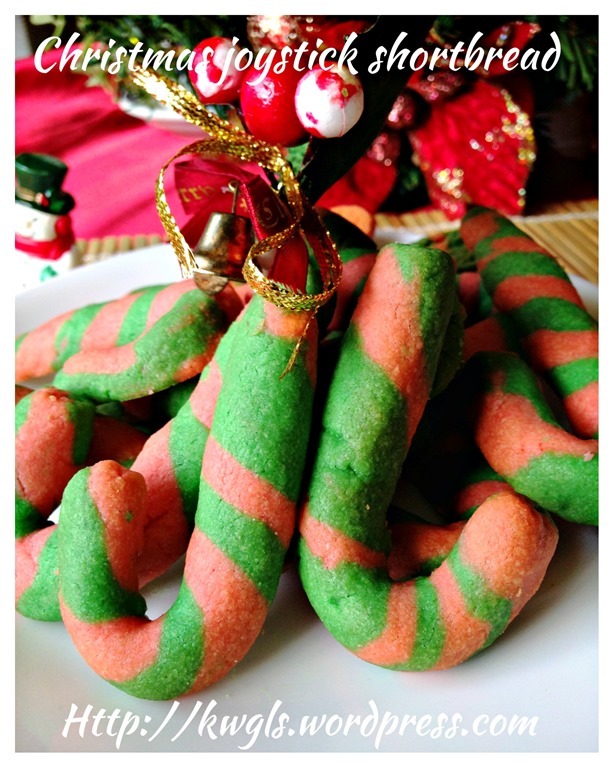 There are cookies exchange programs and household prepared their homemade delicious cookies, nicely packed and presented it as gifts for relatives and guests. 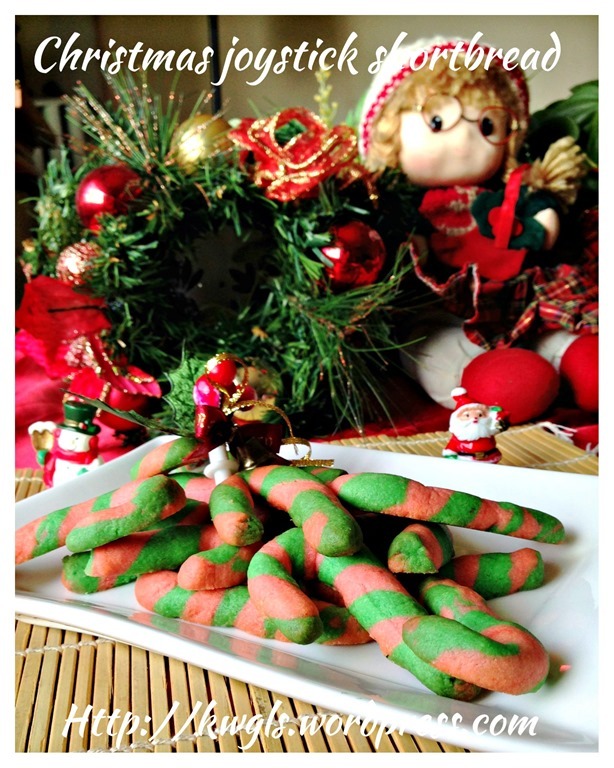 As an Asian blogger, I also want to join in the fun, prepare some uniquely Christmas cookies.. This is not a new recipe. 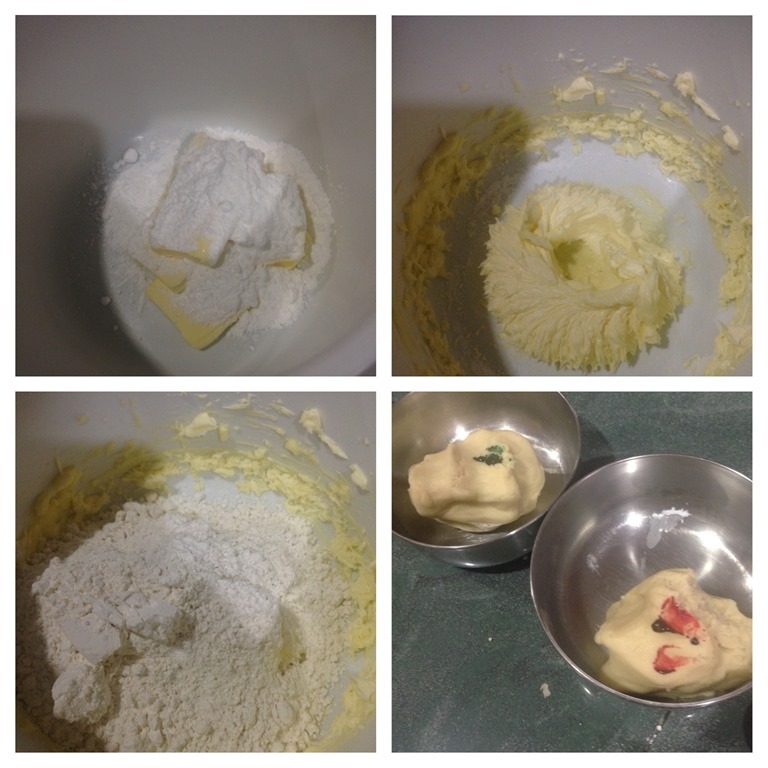 It is a very simple recipe modified from one of the top posts of this blog : One, Two, Three…….Let’s Start Making Traditional Short Bread Biscuits (英式传统牛油饼干）. 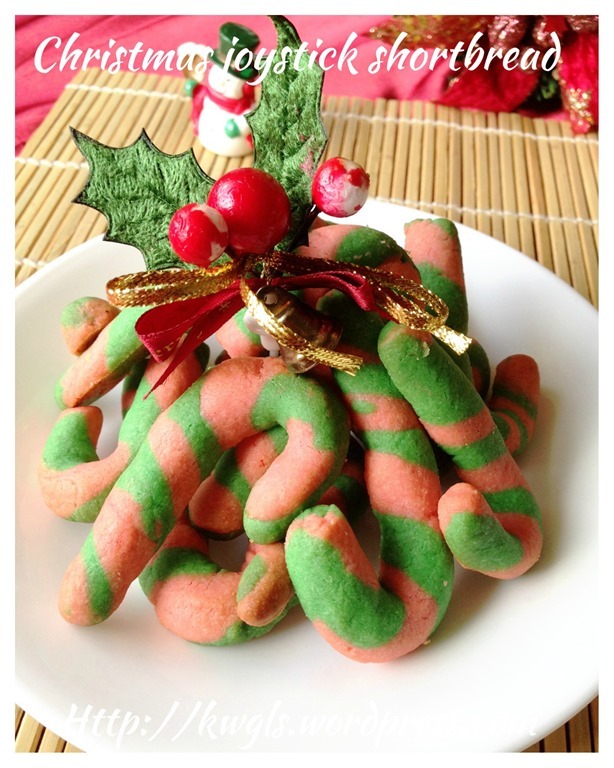 However, the design is from Aunty Yochana blog’s recipe: Yochana’s Cake Delight! 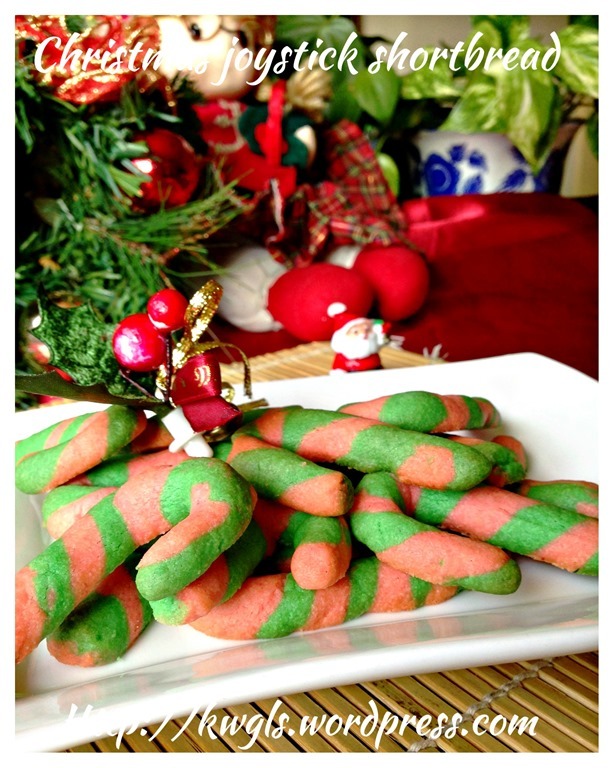 : Christmas Cane Cookies.. She always command my due respect as a pioneer blogger.. I like to search her blog for ideas. If I tell you shaping this is quick and easy, I think I am telling a lie … It is rather laborious.. If you have a domestic helper at home, I am sure it could be rather fast.. If your kids are on holiday, they can also chip in to help.. There are a slight Typo error in my images. 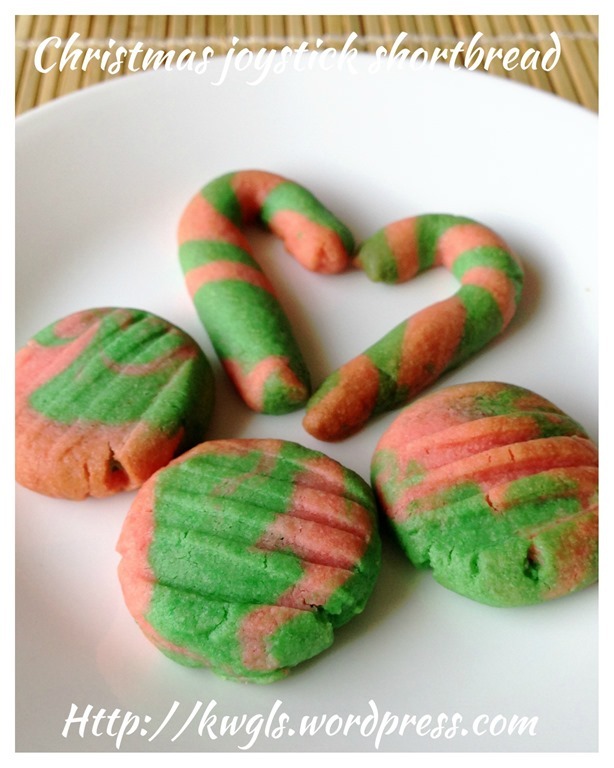 It was supposed to be Candy Cane cookies and instead of joystick cookies. I was given the wrong information that this is called a Christmas joystick, ha-ha. It is rather laborious to change all the images and therefore I have decided to leave it as it is. Pardon me for that. Cream the butter and sugar until light and fluffy. Sift in the flour and lightly fold until well mixed. 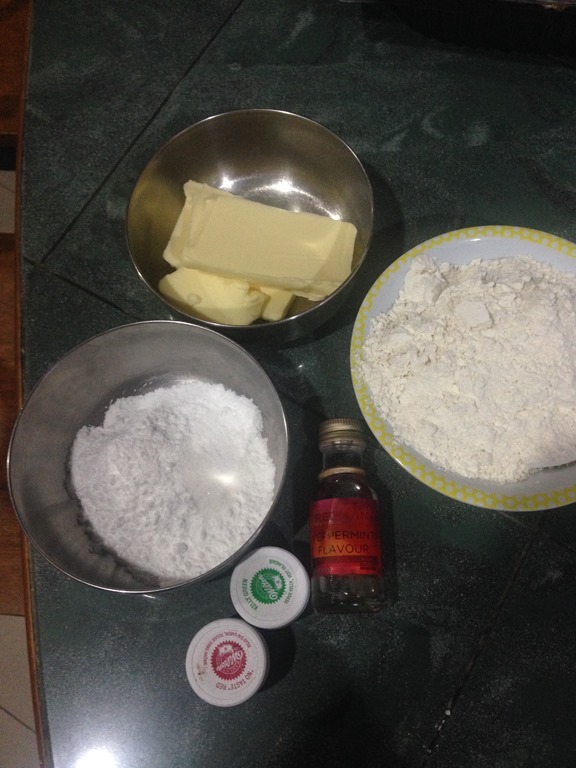 Divide into 2 equal portions. 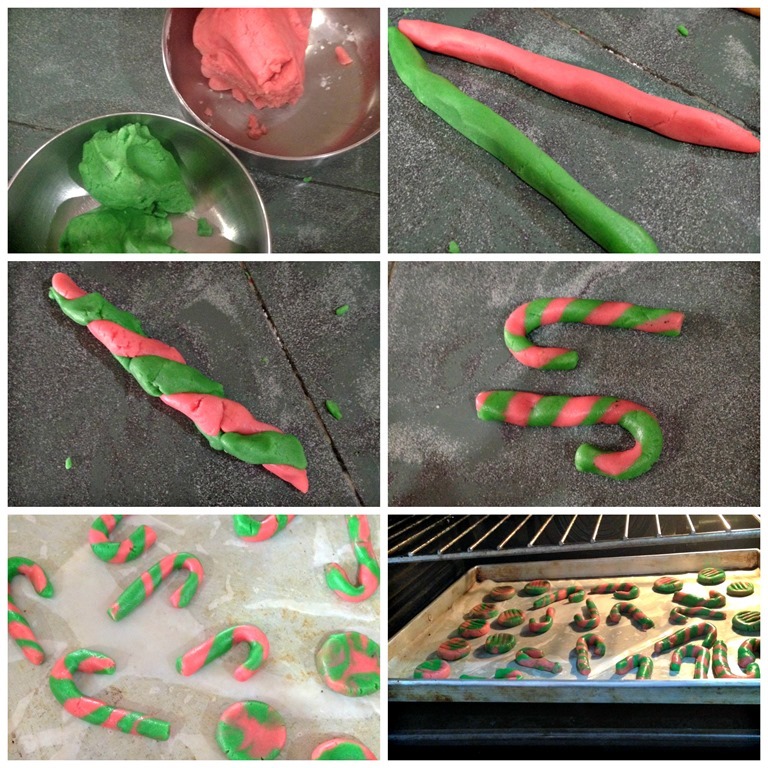 For one portion, add some permitted red colouring and for the other portion, add the peppermint essence and some permitted green colouring. Lightly knead until the colour is consistent. 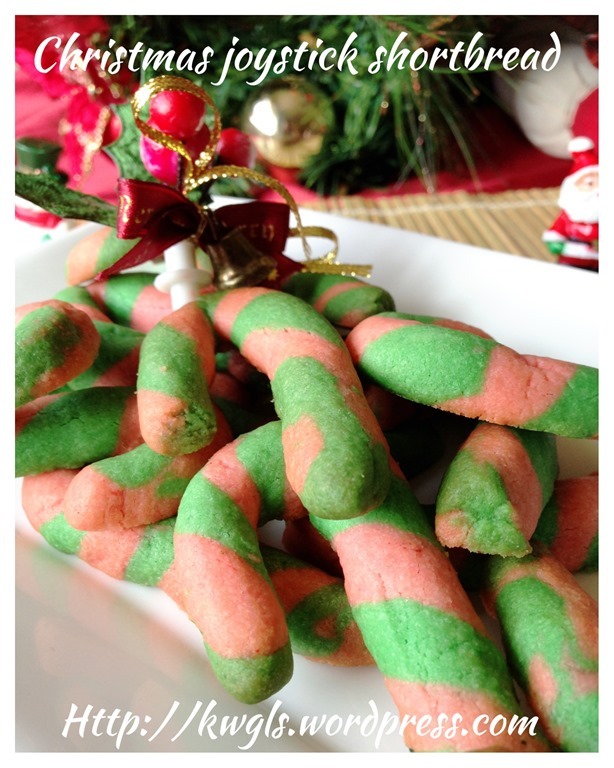 Pinch some dough of each colour and shape it into a long thin stripes. Braid the two stripes to become one . Use your hand to roll in one single direction until the design are well incorporated. Cut the stripes into about 6 cm long. Fold 2 cm of one end towards the other end resembling the letter “J”. Perform the same for all the others. 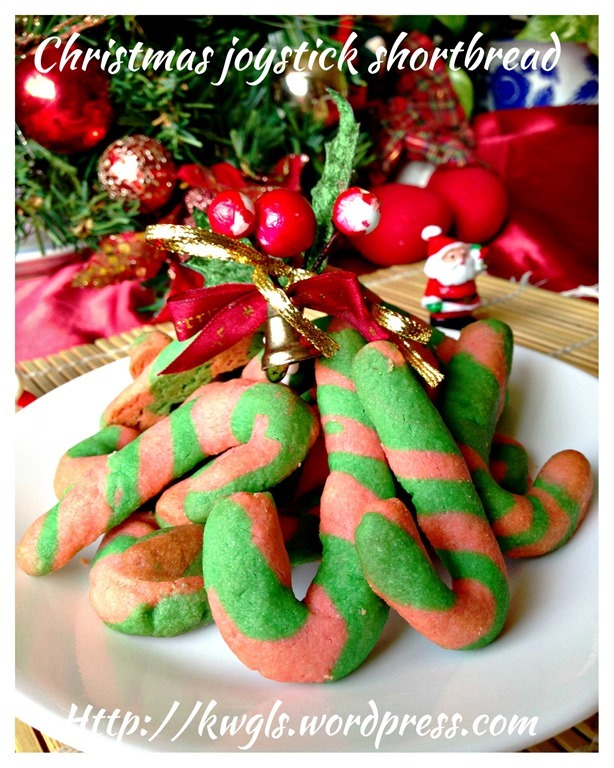 For the round cookies. 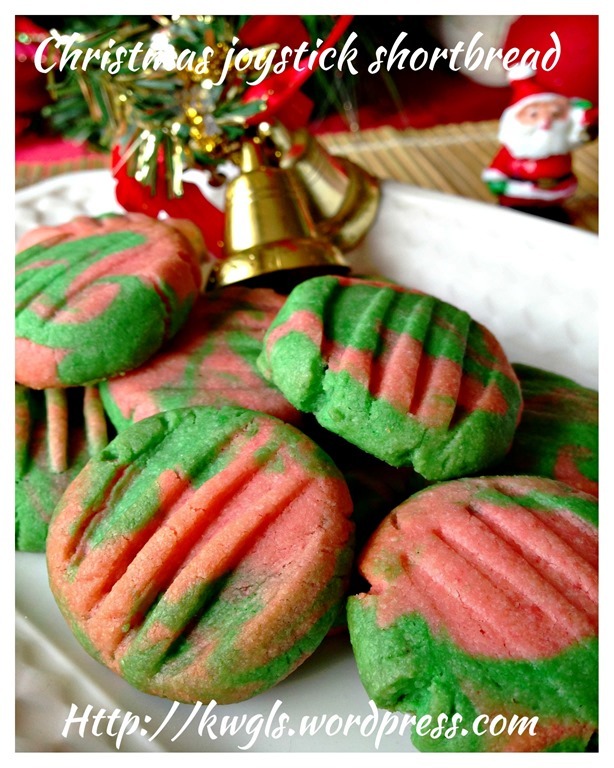 Pinch some green dough and red batter (about 10 grams). Shape it round and use a fork to lightly press on the centre. Bake in the pre-heated oven of 160 degree Celsius for about 12-15 minutes. When taken out from the oven, let it rest in the tray for about 5 minutes before transferring to a rack for cooling. Definitely a presentable gift for those who look for gift ideas. Of course packaging is of prime importance. 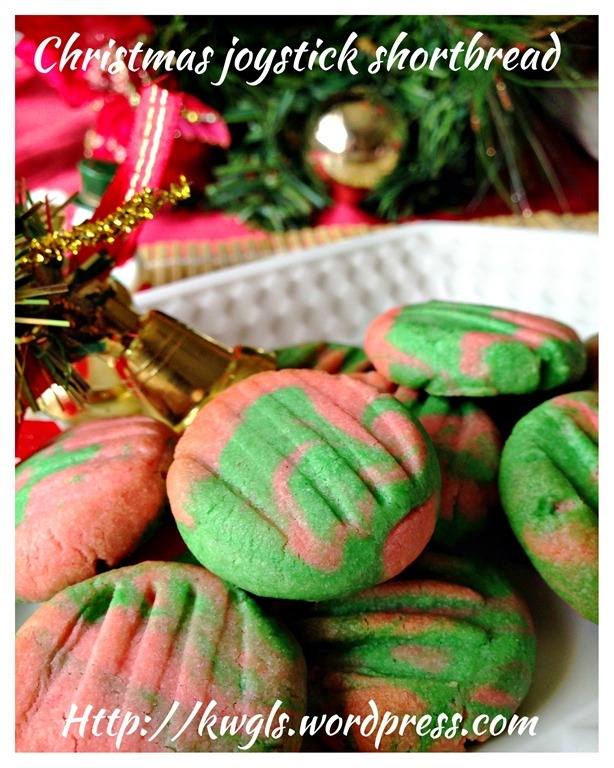 You will be surprised that peppermint blends extremely well with the shortbread. .. 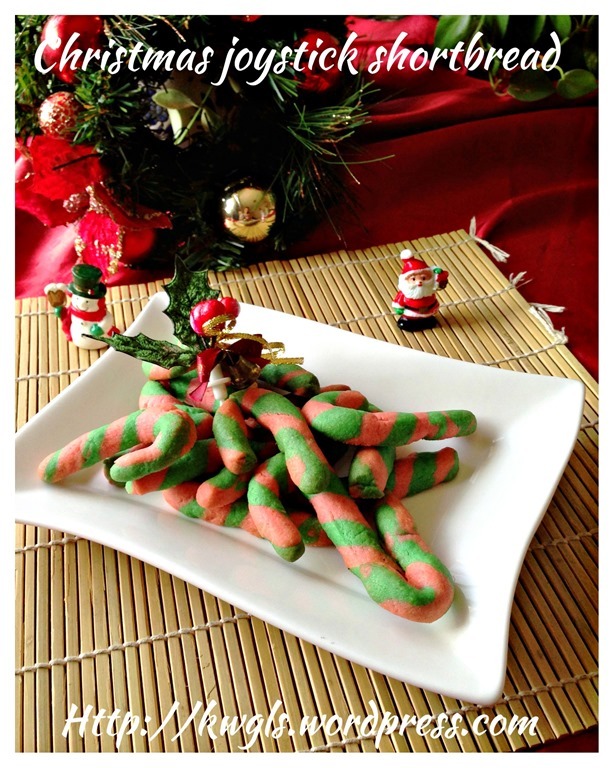 This entry was posted in Cakes and cookies, Christmas, Christmas 2013, Food Preparation Series and tagged 8, candy cane cookies, Christmas 2014, Christmas Candy Cane Peppermint Shortbread, GUAI SHU SHU, Guaishushu, kenneth goh, postaday, 圣诞薄荷牛油饼干. Bookmark the permalink.